MuSIASEM is an open framework able to take into account the economic, environmental, social, cultural, technical and political dimensions in an integrated analysis, accounting for different flows such as monetary, energy, waste or water. As a result, ultimately we can get “congruent” relations among the different set of variables. The results of the MuSIASEM are sets of georreferenced vectorial indicators that are easy to understand, and this is one of the strengths of the method. But it is build on strong and heavy theoretical blocks. Here we summarize its roots. From CST, MuSIASEM has taken concepts that are useful to deal with the definition of the societies as part of a broader hierarchical system and with the different levels of it that are relevant for the analysis of the sustainability. Hierarchical levels of a Socio-Ecosystem. By Cristina Madrid. Under the CST perspective, the Societal Metabolism is a notion used to characterize the processes of energy and material transformation in a society that are necessary for its continued existence, sustainability or Autopoiesis. In order to maintain this, those transformations cannot overpass the thresholds posed by the Ecosystem Metabolism. Both, societies and ecosystems are levels of a Hierarchical System. In them, there are relations that have to be maintained within and among the levels, including the relations that control the biophysical transformations, or metabolic patterns. The metabolic patterns of the social level of a hierarchy depend on its internal and external relations. They pose internal and external constraints to the autopoesis of the system. From Bioeconomics, MuSIASEM has used the flow-fund model of Georgescu-Roegen. With it, MuSIASEM is able to deal with the degrees of complexity given by the different meanings a resource has in each of the levels of analysis and by the relation between them. In MuSIASEM, flow is a semantically open definition for elements that come into or out of the relevant system level during the analytical representation. They give information about what the system level(s) does to maintain itself. Fund is a definition used for those elements that remain there during the complete time of the representation. They are the components of the system that must be maintained. Definition of a tractor as a flow and a fund. By Mario Giampietro. Examples of flows are the energy, food and water used to keep the society alive. Examples or funds are the humans that have to be maintained at the social level or the rivers and aquifers that give the identity to the ecosystems. The different types of land are also considered fund elements for both social and ecosystems. Some resources can be flows at one level and funds at other levels. A tractor is a flow going out of a building factory, but is the fund that has to be maintained with petrol in a farm. Water is a flow that cleans and feeds the social system, but also a fund in the form of a river whose water quantity and quality must be maintained for the sake of the ecosystem. These relations between flows and funds at one level and the flow and the fund definition between levels, is used by MuSIASEM to connect levels of analysis and to check the impacts that human activity creates in the environment. Post-Normal situations requiring a new way to use science. By François Díaz-Maurin. One of the main strenghts of MuSIASEM is the ability of allowing a representation of the performance of a system which takes into account different but parallel non-equivalent domains. These domains are formulations of the same problem from different perspectives, as for example the information given by hydrological and economic models, or the information and interests managed by stakeholders and policy-makers. This is a known issue when dealing with sustainability and complex systems. Due to the heterogeneity of the available information, at each of the levels of the analysis data is usually irreducible the information coming from different levels is incommensurable. MuSIASEM relates the biophysical and socioeconomic variables and makes possible to link the metabolism of societies with the potential constraints of the natural environment. This way it serves as a tool to support decisions in situations when a high level of subjectivity is unavoidable. Giampietro M, Mayumi K (2000). Multiple-Scale Integrated Assessment of Societal Metabolism: Introducing the Approach. Population and the Environment 22.2:109-153. Giampietro M, Mayumi K (2000). Multiple-Scale Integrated Assessments of Societal Metabolism: Integrating Biophysical and Economic Representations Across Scales. Population and the Environment 22.2:155-210. Giampietro M, Ramos-Martín J (2005). 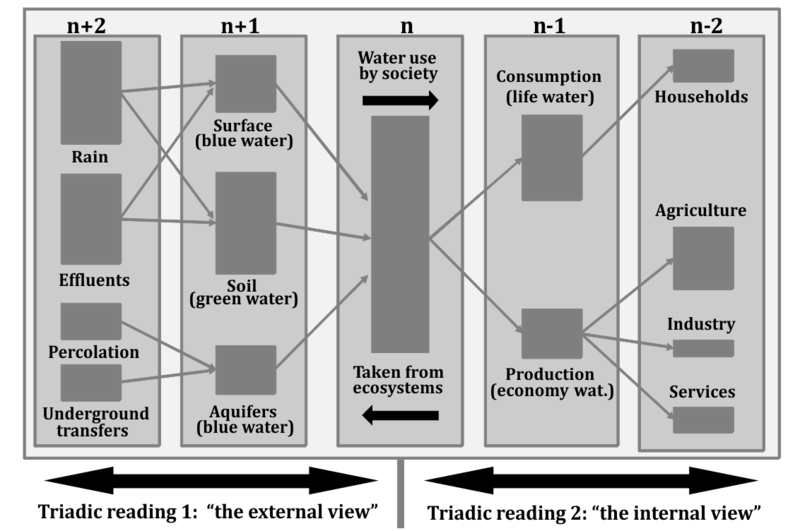 Multi-scale integrated analysis of sustainability: a methodological tool to improve the quality of narratives. International Journal of Global Environmental Issues 5.3-4:119 – 141. Giampietro M, Mayumi K, Ramos-Martín J (2009). Multi-scale integrated analysis of societal and ecosystem metabolism (MuSIASEM): Theoretical concepts and basic rationale. Energy 34.3:313-322. Giampietro M, Sorman AH (2012). Energy Analysis for a Sustainable Future: The Multi-Scale Integrated Analysis of Societal and Ecosystem Metabolism. Routledge.